ROSEMONT, ILL, OCTOBER 10, 2018 -- When there is a need for temporary power to portable and permanent electrical equipment, Emerson offers its new Appleton™ U-Line™ Interchanger 15 and 20 Amp plugs, engineered for service in hazardous, wet and corrosive locations. 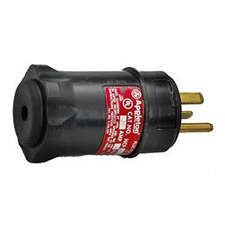 The plugs are ideal for the delivery of safe, reliable power to lighting systems, power tools, welding equipment and compressors, among others, especially during plant turnarounds and other maintenance applications. Offered a wide range of hazardous location ratings and certifications, including those for Class I, Div. 1 and 2 areas where ignitable vapors are present, Appleton™ U-Line™ Interchanger 15 and 20 Amp plugs feature an exclusive NEMA Type 4 watertight rating to provide a safe outdoor power solution for construction sites, drilling rigs, wastewater treatment centers, and petrochemical refineries. The NEMA Type 4 watertight rating results from a gasket set between the base and the housing that prevents water and dust from entering the plug, even when it is unmated, significantly reducing the risks of short circuits, power outages and damage to vital equipment. "In extreme conditions, reliable power distribution requires a plug capable of withstanding rough use and constant exposure to harsh weather," said Frank Cunningham, Marketing Manager for Emerson Automation Solutions. "There is no better plug for these demanding environments than the rugged, virtually maintenance-free U-Line Interchanger. By ensuring reliable power distribution the U-Line Interchanger keeps production processes from being halted and costs from adding up, while minimizing the safety hazards." Installing heavy-duty, explosive-proof plugs in industrial facilities can be a time-consuming task for electricians. To overcome installation challenges the Appleton U-Line Intercepter's terminals are larger than traditional designs so the plug is faster to wire and access. In addition, it replaces specialized screws with standard sized ones that are easier to tighten and don't require unique tools. A redesigned grommet at the end of the plug makes for simplified cable insertion, plus a mechanical clamp prevents strain on the cable and meets the UL 150 lb strain-relief test for classified lcoations. Appleton U-Line Interchanger 15 and 20 Amp plugs by Emerson are engineered for industrial applications or environments that require Class I, Division 1 and 2 Groups B, C, D ratings and/or Class I, Zone 1, Group IIB + H2 ratings; Class II, Division 1 and 2 Group F, G ratings; and Class III ratings. The plugs mate with most Appleton U-Line receptacles and those from third-parties. Emerson (NYSE: EMR), headquartered in St. Louis, Missouri (USA), is a global technology and engineering company providing innovative solutions for customers in industrial, commercial, and residential markets. Our Emerson Automation Solutions business helps process, hybrid, and discrete manufacturers maximize production, protect personnel and the environment while optimizing their energy and operating costs. Our Emerson Commercial & Residential Solutions business helps ensure human comfort and health, protect food quality and safety, advance energy efficiency, and create sustainable infrastructure. For more information visit www.emerson.com.